Origin and Habitat: Cleistocactus baumannii subs. horstii occurs at the border of the Pantanal swamps near Porto Murtinho (in the lowlands of Rio Amoguiy), south-west of the federal state of Mato Grosso do Sul, Brazil. Altitude range. 100–200 metres above sea level. Habitat and ecology: This species grows in the boundary region between the Pantanal and the eastern reaches of Chaco. Pantanal is a huge marshy area extending from western Mato Grosso to Bolivia. Large areas are flooded every year, with dry areas only located above the grasslands and cerrados. Cleistocactus baumannii subs. horstii grows together with the palm Copernicia in dry forests. It creeps among other vegetation mostly at the edges of the hummocks (floodplain) between the vegetation of the wooded islands that stands just above the high water level of the rainy season. The plants, that are characterized by pendent growth, occasionally hang down from the tops termite hills. The average annual temperature is between 24 and 25 ° C, the average annual rainfall is slightly more than 1000 mm. Gravely sites and crystalline rocks are the preferred place for the growth of cacti. Description: Cleistocactus baumannii subsp. horstii is one of the morphological or local forms of Cleistocactus baumannii. 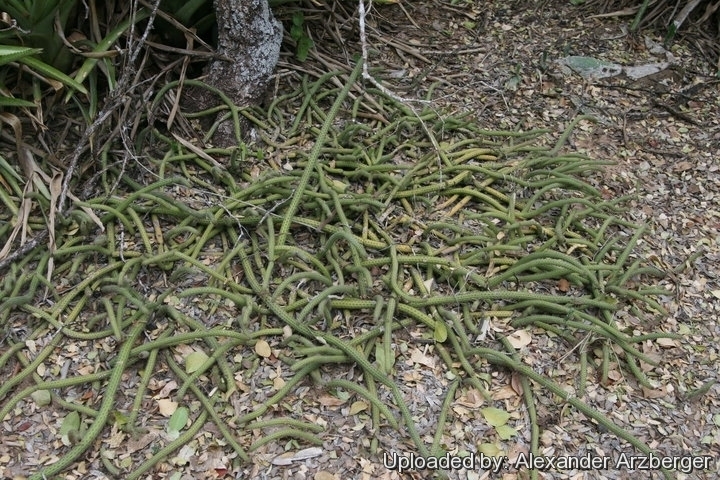 It is a shrubby cactus, branching basally with thin and flexible branches, that scramble on the ground forming tangled clumps to 1 m tall and 2-4 metres in spread, or works its way through shrub branches. The stems are fairly stiff, to 2 m or more long, less than 2,3 cm in diameter, with about 10-13 ribs, 11–15 radial spines, to 5 mm long, yellowish to dark brown, bright tipped and 1 central spine to 2,5 cm long. The flowers are 5–7 cm long, zygomorphic orange-red. The red fruits have a white flesh. Derivation of specific name: This member of the Cactaceae family was given this name in honour or Leopoldo Horst (1918–1987), German-born Brazilian cactus collector and exporter in Rio Grande do Sul. Stems: At first erect, then arching or creeping, but the tip of the shoot turned upwards (decumbent). Branches light green, 12-23 mm diameter, up to 200 cm in length. Ribs: 10-13, rounded, flattened, with wavy grooves and often divided in elongated octagonal tubercles, one for each areola. In turgid mature stems these ribs are very flat and barely visible, less than 0.8 mm in height, but in time of drought, the ribs appears wrinkled up to 1.5 mm hight and 2-4 mm wide. Areoles: 1-1.5 mm long and 1 mm wide, oval, with dark hairs, later becoming lighter, 5-7 mm apart. Radial spines: 11-15, 2-5 (or more) mm long, variable in thickness and strength, but always very thin, needle-like, brittle, white and grey. Central spines: Typically 4, arranged cross-wise (placed at right-angles) , thickened at the base; the strongest directed upwards, all light brown to grey-brown, 3 mm long, rarely up to 10 mm in length (12-25 mm long in flowering areoles, the upper spine often up to 30 mm in length). Flowers: Strongly zygomorphic, double-curved, 7-8.5 cm long, in throat about 1.5 cm wide, in the middle of receptacle 1.3 cm wide, and only 7 mm wide just above pericarpel. Pericarpel almost round, pale brownish-red, 9 mm wide, 7 mm long, grooved, strongly covered with scales; the scales at the base c. 1 mm long, pointed, fleshy, pink, with very thin curly hair 3-5 mm long in the axils. Receptacle tube pink-red, strongly bent upwards at a distance of about 7 mm from the pericarpel, furrowed, with, pink-brownish scales, thickened at the base, and bright red above, about 1.8-3 mm long and 1.8-3 mm wide, with longer white hair in the axils. Perianth segments in 4-5 whorls, the lowest segments sharply curved up, bright red with thin, translucent edges, inner segments wider and more rounded at the top, all the segments with reddish veins and slightly thickened middle rib. The tip of the inner segments is usually bent outwards. Outer segments thinner 5-12 mm long and c.3 mm wide, inner segments gradually enlarging, c. 12 mm long and 6 mm wide. Basal filaments 3.8-4.3 cm long, forming a circle at the base of the tube and fused lengthwise along the receptacle. Upper filaments up to 3 cm long attached at different distances up to about the middle of receptacle. The upper part of the flower tube is strongly grooved due adherent filaments, which are released only at the edge of the flower. All filaments glassy white below, and pink to purple above. Anthers purple, 1-2 mm long and 0.5-1 mm wide, but covered by white pollen grains. All filaments protrude from the flower tube at different levels (up to 1.5 cm). Style 6-7 cm long and 1 mm wide, yellow-white, not fused to the tube; stigmas lobes 5-6 yellow-green, 3-4 mm long, 0.2 mm thick. Flowers are autosterile and remain open for a few days and nights. Fruit: Spherical, slightly elongated above 17-19 mm in diameter, smooth and shiny, slightly ribbed only at the very top, light pink, darkening above and whitish at the base of the dry flowers remnants. Dry perianth with white tufts of hair. Seeds buried in thick white fruit pulp. Young fruits are dark brown, and then become wine-red and strongly grooved, finally at the end of the maturation process, will take a bluish-purple colour. After that, the fruit becomes turgid, smooth pink and falls off. Seeds: 1.1-1.5 x 1.1 mm, rusty-brown to black-brown, shiny, ovoid to helmet shaped, obliquely flattened. Cultivation and Propagation: Cleistocactus baumannii subs. horstii is a a much decorative hardy cactus. Growth rate: This species grows rapidly enough to need pruning.